I lay, tired at last. With this against darkness to hold. something we shared was worthwhile. Categories: Poetry | Tags: barefoot poetry, Frazetta, Hero, SS Matthews, Warrior, weary | Permalink. but, inside alive I will keep you…the memories and love held within..
Love this… especially the ending. Oh, those last two lines. I think there is something worth while in any sharing…but there is a sadness in this, not knowing if the other would feel that same way! 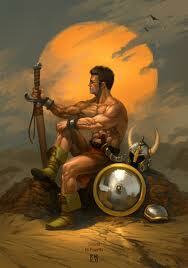 very good, love Frank frazetta’s picture too, his Conan stuff is mega. I have to believe that something, even the smallest bit, was worthwhile. Thank you so much for joining us at wePoets! I love your poem and we would be happy to showcase your talent! The pleasure is mine. That sounds fine, do you have something already in mind, or should I send in a submission? It’s wonurefdl to have you on our side, haha!